Description: Perennial, rhizomatous, myco-heterotrophic herb lacking chlorophyll; stems up to 55 cm high, erect, cream to pale pink in color, with 4 to 6 reduced leaves or bracts that are well spread along the stem below the inflorescence; flowers 13 to 19, each subtended by a bract that is up to 12 mm long; sepals and petals white, variously tinged with pink and yellow; veins in pale shades of maroon; sepals up to 25 mm long, narrow, up to 5mm broad, and coiled back onto itself in the upper half; upper petals 2, slightly shorter than the sepals, and coiled in a similar manner; rostellum, separating the fertile stigma lobes from the stamens, is present. Flowering from mid-May to mid-June. Similar Species: The central lobe of the corolla lip in individuals of H. colemanii is acute compared to the truncate lobes in those of H. revoluta. The midlobe of the lip extends more than twice the length of the lateral lobe, instead of less than twice the length, and the tepals are more revolute. Hexalectris colemanii differs from H. arizonica in having thinner perianth parts and an acute instead of rounded apex of the central lobe of the lip and in bearing a rostellum. H. warnockii flowers later in the season (August), has pronounced keels that are irregularly scalloped and broken towards the apex of the midlobe. Also, their petals are purple or maroon, linear or lanceolate-falcate, and not revolute. Habitat: Most commonly found in well-developed stands of gray oak (Quercus grisea) in areas of high oak leaf litter with low forb and grass densities, at elevations between 1,315 and 1,826 m (4,315 - 5,990 ft). Hexalectris colemanii occurs on all aspects of rocky and alluvial slopes of intermittent drainages. Remarks: The number of flowering individuals may vary greatly from year to year, depending on temperature, nutrient availability, and rainfall, or a mixture of these. Conservation Considerations: Mining and invasion of exotic species pose a threat to the habitat of H. colemanii. The impacts of wildfire have not been studied. Baker, Marc A. 2012. Current knowledge and conservation of Hexalectris colemanii (Orchidaceae), Colman's coral-root. Final report prepared for the USFWS, Tucson, AZ. Southwest Botanical Research, Chino Valley, AZ. *Catling, P.M. 2004. A synopsis of the genus Hexalectris in the United States and a new variety of Hexalectris revoluta. 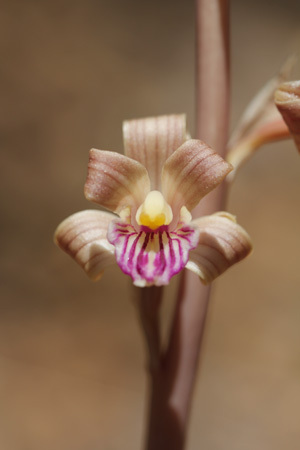 The Native Orchid Conference Journal 1(2): 5-25. Kennedy, A.H., and L.E. Watson. 2010. Species delimitations and phylogenetic relationships within the fully myco-heterotrophic Hexalectris (Orchidaceae). Systematic Botany 35(1): 64-76.